Stacking The Shelves is a weekly meme hosted by Tynga's Reviews. Can you believe Christmas is only 9 days away? INSANE! Any who, let's do this, shall we? *Wherein I root and rave about FINGERPRINTS OF YOU by Kristen Paige-Madonia. *Waiting on Wednesday featuring books by Jordanna Fraiberg, Leigh Fallon, and Nancy Ohlin. *Don't forget to enter the Goodbye 2012 giveaway. 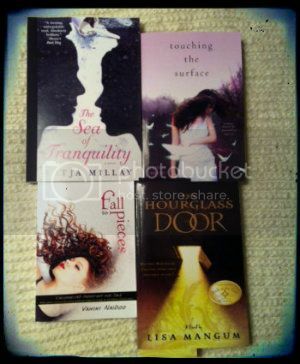 You could win any 2012 YA book of your choice! EEP! I can not believe how close we are to Christmas *faints* Great books...looks like you have your holiday reading all set!! Oh,you got The Sea of Tranquility! I read it a week ago and I still can't find words. It was so good. I want to read Touching the Surface. I've seen "The Sea of Tranquility" all over the place! My library doesn't have it yet, though. :/ So it'll be a while before I find out if it lives up to the hype. Touching The Surface looks so good. I can't wait to read it. GREAT books! No lies, I want to read all of those too. Especially Touching the Surface. I've been awaiting that release for a while. Happy reading! Great set of books!!! Loving the covers to Fall to Pieces & Touching the Surface! You're welcome! I can't wait to see what you think of Touching the Surface!